A spectrum – red, yellow and green – illuminates. A traffic rainbow that means turbines are operational. 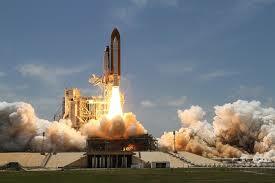 A buzzer squeals overhead: propulsion jets are ignited, pushing 100,000 pounds per square inch against the launch pad. A faint, buffered remnant of that force shakes her seat. She yanks her chest strap tight and calls “Check!” from her diaphragm into the helmet mike. Vital signs: heartbeat 15% elevated, inside normal range. Co-pilot at 28% and rising. She messages the second cockpit: Breathe slowly. The propulsion buzzer is louder there; his seat is closer and less insulated. Her pre-programmed message reminds him that the vibrations – heavier than hers in the nose cone – are normal. Her vitals remain within normal range; the co-pilot has steadied. Both facts make her feel a little cocky. She sends another pre-programmed message congratulating him. She sees the results of his machine checks and knows he can, at least, complete his tasks. She approves his checks and moves on to her own. Her eyes sweep the indicators and she counts off her machine checks. “Oxygen… Check. Coolant…” She is remotely aware of the sun edging over the horizon, sending a single sharpening ray through the cockpit hatch window. “Now push all the breath out.” His vitals stabilize on her screen. Liftoff. Houston, we have liftoff. …4,000,000 foot-pounds of torque push against the bounds of earth. She blinks, feels her own adrenaline as if it were rising in her throat, and checks on the co-pilot. He’s still quite alive, but he has passed out.